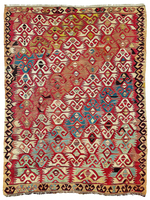 This small red-ground kilim woven in a design of narrow horizontal stripes in alternating colours, with several brocaded motifs, is the face or back of a large storage bag used by Anatolian nomads. This Yürük tribe probably lived in Cappadocia, and its exact identity is now unlikely to be established. Whereas just three stripes adorn the open centre of the field, dense clusters of stripes are seen at both ends. – Signs of age and wear, damaged ends, minor missing sections. Mounted onto canvas.